Manufactured out of Mifflintown, PA, our Premium Hardwood pellets are made of the finest blend of hardwoods that provide an ash content well below the industry standard of 1%. 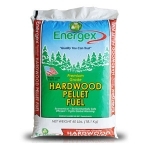 With the BTUs (on a dry basis) between 8,500 and 8,600, these hardwood pellets can put out a lot of heat with low ash at a great low price. 40 lbs.